InstaCasino started out in 2014 by experienced marketers from the gaming industry. After reaching market in 2015, they have become easy to access, intuitive and fun online hang out place for gamers and gamblers alike. Their mission is simple: providing players with a unique gambling experience that is fast, secure and friendly – simply unique. InstaCasino offers a lot of different types of bonuses, and has a larger variety than most of their competitors. 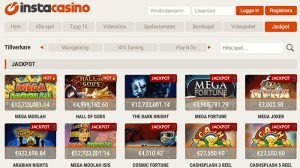 While others offer simple bonuses such as a fixed number of freespins and a certain bonus percentage on the first deposit, InstaCasino has taken it a step further. On the bonus page, you can easily get an overview of the current bonuses available, as these may change from time to time. The exact percentages and number of freespins may change, so make sure to follow the news on their official website if you want to stay tuned on the recent bonus deals. The wagering requirement is 40 times on the 100% bonus, and 35 times on the 50% bonus deal. To make a withdrawal, a minimum deposit of $20 is required (200kr, €20, £20). Other sweet deals include SpinThursday, which gives you bonuses when applying the bonus code of the week, and 10% cash back every Sunday. This basically means that every Sunday, every week, you get 10% of your loss back. If you win, however, you get to keep the entire amount. InstaCasino also offers surprises to its most frequent visitors and loyal players. Every now and then, they send out bonuses and freespins, and to get more information about how and when, it is advised to subscribe to their e-mailing list. InstaCasino offers a unique playing experience, where it is easy to sign up, navigate and most importantly; start playing. The number of games is significant, and all types of players should be able to find something that matches their interest. The most popular games these days, according to the website, are Casino Hold’em, Blackjack B and VIP Roulette. Other favorites among gamblers include Gonzo’s Quest, Twin Spin, Blood Suckers, Mega Fortune and Starbust. Gaming software is, for the most part, provided by familiar gaming producers such as NetEnt, MicroGaming, Betsoft and Play’n Go. InstaCasino has a fully functioning mobile platform, so that you can easily access your favorite games from your smart phones or tablets. The variety of games is good also on the mobile version, featuring many of the popular games known from the PC or Mac platforms. The InstaCasino customer support is open from 08.00 am till 00.00 every day, and can be reached via phone or e-mail. Unfortunately, there is no FAQ section on the website, so if you have a rather common question that you’re sure others might have had before you, there is no other way of finding out than by actually making that call or writing that e-mail. Or alternatively, look it up online, if you have a question outside of the customer support opening hours. As opposed to many other online casinos, InstaCasino also lacks the Live Chat function, so an FAQ section, or alternatively 24/7 support function, would increase its competitiveness significantly. Maybe they are still in a phase where they are gathering enough data to actually carry out a valid FAQ page.